This week's Ten on Tuesday is kinda odd for me. You see I've never knit a sweater. I've lusted after handknit sweaters, but when it comes right down to it? Nope. Shawls. That's what I knit. But I'm going to play along, because I do have sweaters in my queue over on Ravelry, and since I'll be in the hospital next week for my shoulder replacement, I really don't want the blog dark TWO Tuesdays in a row! So without further ado, I give you: 5 Favorite Sweater Patterns and 5 Favorite Yarns to Use. The total of these is 10. 1. Coal Cardigan. I've never knit with Shelter before, but I've lusted after it...so you know if I win the lottery? I'll use it. 2. Iced Cardigan. I just adore this pattern and would probably use something like Berrocco Vintage Chunky for it - this is more than likely the sort of sweater that would get worn a lot, so I'd want a yarn that had a washability to it. 3. Inggun. Okay, it's a sweater vest, but oh those cables...! I'd use something lovely that would make them pop, that's sure...I'm willing to use the Elspeth Lavold Calm Wool. 4. Jadis. I have the yarn already - I have the pattern already...why am I not knitting this??? Okay, the yarn is one I bought at a resale my knit group had: it's a Berger du Nord wool/camel blend in navy blue. Oh my...scrumptious. 5. Rose & Picots Cardigan which is knit in Rowan Scottish Tweed. I adore tweed. Why would I pick anything else? 1. Stuffing. My mom used to make the BEST sage stuffing, from scratch. These days, I'm prone to making the boxed Stove Top herbed version, which is so very close to hers, it makes no sense to work from scratch. I tend to decrease (substantially) the butter called for in the box, and I NEVER stuff the bird. (The bird is "stuffed with an onion, an apple, and an orange - if I remember to get one - each cut in half - and fresh sage is tucked under the breast skin - the fruit and veggies lend moisture and flavoring as the bird cooks. But as an aside, I won't be cooking this year. With shoulder replacement surgery on the Monday before, and release from the hospital on Wednesday before the holiday, we're buying a ready-cooked bird this year, and hopefully getting some help from family to bring in the side dishes. 3. Cranberries: Mom used to make her own jellied cranberry sauce, and I can't tell you how many years she was beside herself because it wouldn't "set up." I decided many moons ago to buy the canned Ocean Spray jellied style, because I like it. I hate having to deal with the headaches of "it didn't do what it was supposed to do." But then last year, for my first Thanksgiving with My Sweetheart and his son, I decided to try something: I bought the Ocean Spray Cranberry Relish. And added things to it. It was GOOD! Do I remember what I put in there? Well...not exactly. This year, I'm going to try to recreate it. If it works? I'll share that. 4. I love to bake Acorn Squash with a spoonful of Vermont Maple Syrup in the cavity. Not too many of my family care for it, but it shows up, like it or not. 6. Rolls. Dear Daughter is addicted to the Pillsbury Dough Boy's Crescent Rolls. So are her children. Obviously? That's what we have (tho' I do buy the low-fat version). 7. Assorted pickles and olives. My Sweetheart doesn't care for these, but I tend to make up a relish tray, same as my mom. Gherkins, Bread & Butter, Dill, Sour pickles, and then Kalamata and Spanish Olives (with pimentos, of course), end up being available. 9. I usually, when I'm cooking, have a raw veggie tray for the kids to munch on till things are ready: so there's bell peppers, celery, grape tomatoes, carrot sticks. You know the drill. 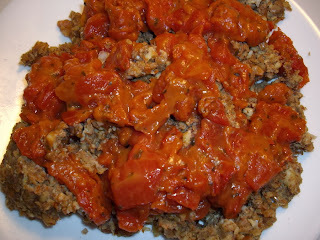 The photo above shows a full plate of nutloaf with the thicken tomato sauce that goes with it. 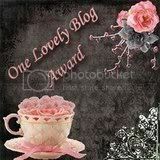 I'm adding the link here to a blog post over on Nana Sadie's Place where I showed folks how to make the Nut Loaf recipe. So there you go. My Thanksgiving meal is going to be a mashup of mostly prepared - by others - stuff this year. But that's just fine. The reason for the season is to give thanks. I'll be darn thankful to have my folks with me, and the surgery behind me. 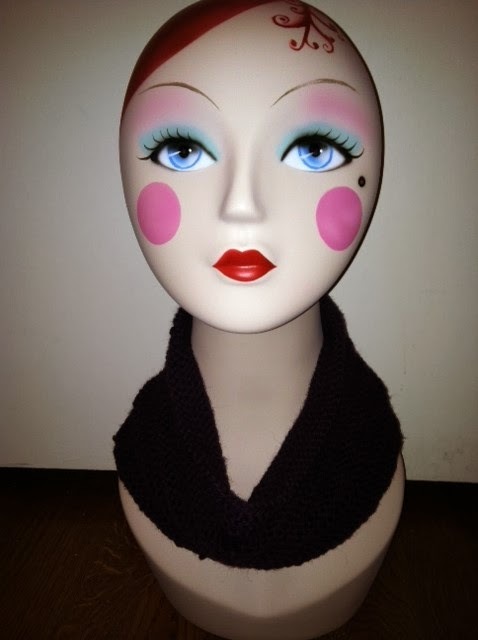 My Downtown Christmas Ever After Cowl. This is the Lorna's Laces in the Sportweight that I bought last holiday season to participate in the Christmas at Downtown Mystery KAL from Jimmy Bean's Wool. But I didn't have time to start when everyone else did, and as things went along, knew I didn't want to use the yarn that way. 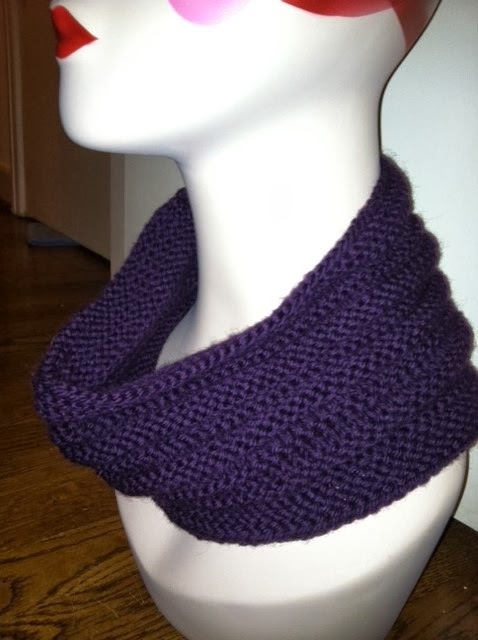 So now, here I am using the Ever After Cowl pattern (it's a freebie on Ravelry!). And for those of you who know me well, you should find it not the least bit surprising that I'm loving this little feather and fan pattern. (I do think F&F is my all-time favorite pattern in the world!) 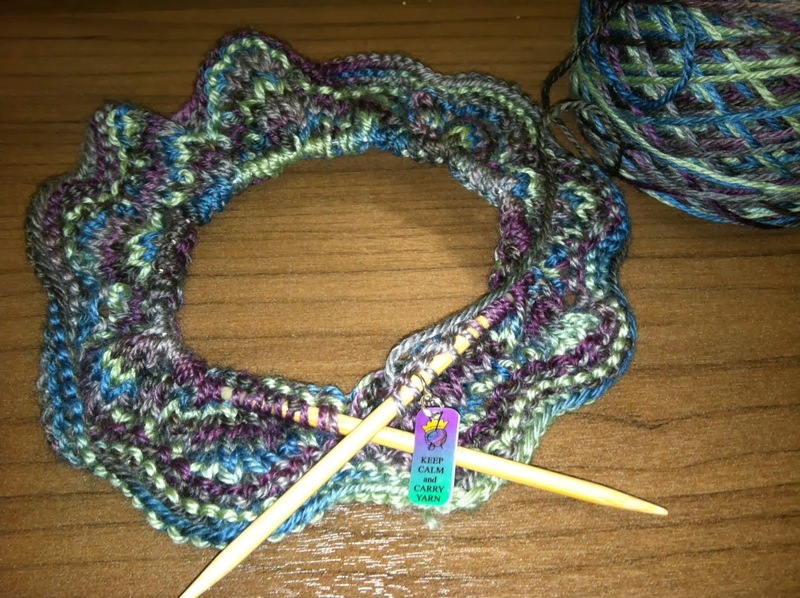 I chose to use the sportweight (the pattern is created for worsted) and downsized the needles to size 6 from 8. I love the fabric at this point, so I think all that was a good choice. It won't be quite as big around the neck, but that's exactly what I wanted, anyway! 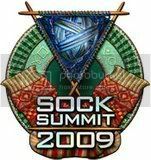 And about those socks? Well, I'm up over the heel and progressing up the ankle. With luck they'll be done and done by next weekend. I hope. 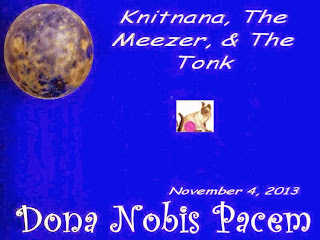 Every year, Knitnana has participated in the Blogblast for Peace that Mimi Lennox has sponsored. I don't often talk much about it, but I'm a Peacenik from way back in the early 70s. Black armbands, and peace signs and beads, "We Shall Overcome" and all the rest. I haven't changed much in all these years, I still agree with Jon Lennon that it's possible, tho' very difficult to Imagine. I think it still is, tho' I think it's getting harder and harder. A group of like-minded folks make a difference here every year, but I wish we could spread it farther, longer, wider, deeper. Tonight will be a meditative evening for me as I ponder, again, the possibilities of world peace. Let's all try to give it a chance? Indeed! And I hope it lasts a long time...too many projects in process and I'm hoping to clear out some of them. Today is NoSoKnit, so you can imagine that I'm knitting away, since I posted this yesterday evening and scheduled it to hit after we started (so that the second project down there is a surprise at the actual event!). Thanks, Karen, for doing such a nice job showing it off! This is the second time I've knit this project for NoSoKnit charity gifting. 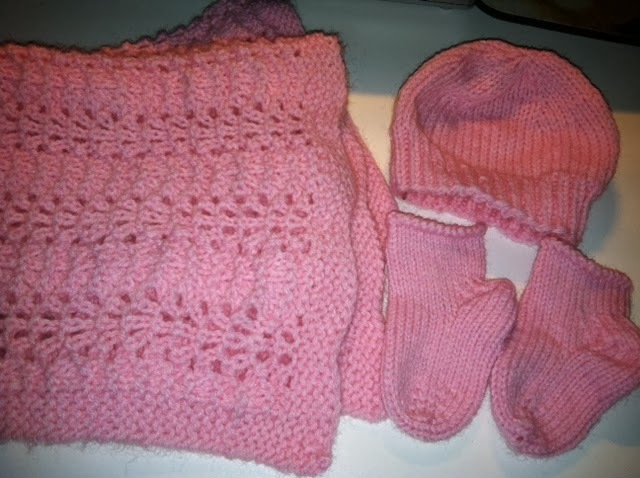 It's an extremely easy Feather and Fan blanket and then a cute teensy hat and pair of socks. 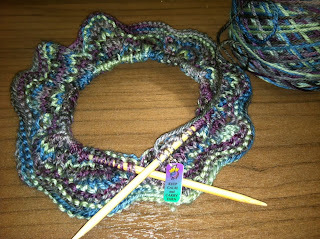 The yarn is okay (I don't love acrylic), and just what they want, so I can't really complain. I promise I'm enjoying myself. I don't plan to spend much, if anything this year (but will update you if I do). Things are going to be awfully tight during the month of short-term disability, and I won't want to be spending money for anything that's not absolutely necessary, so I expect you'll not see a purchase this time. (Besides, I've got so much yummy stuff in my bins! I will try hard not to be tempted.